More business - high conversion rates! Secure also for your hotel, a decisive competitive advantage! With more than 1 million business professional visitors each year, tagungshotel.com and conferencehotel.com, are ranking among the leading event portals in Germany and Europe. 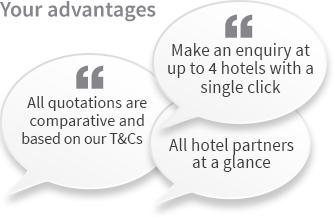 By presenting your hotel or event location on our portals, you can reach more than 10,000 corporate customers and businesses from all industries and of all sizes, all of which make use of our system for their booking requests and reservations. Professional presentation of your hotel at tagungshotel.com in full service with a direct link to search engines and your own website within only 5 days! Unique Online Bid-Management for a fast and simple processing of even complex event requests within a few minutes, with a clear overview of all already processed requests and confirmed bookings. First-hand event and group bookings are free of commission! It can be so easy to book a meeting! Your hotel is not yet listed at meetago? Then click here and make sure you register your hotel still today!